Surviving Horror is a periodical series about my favourite video game genre, survival horror. With it, I hope to explore how the genre got its start, how it effectively manages to scare us as players, and how it has evolved in term of mechanics, themes, and storytelling over the years. Well, this was a surprise. I was debating with myself over what I wanted the next one of these to be (for the record, torn between feeling obligated to finish Daylight and wanting to press on with the Whistleblower DLC for Outlast.) As it happened, Sony provided me with secret option C when they introduced the enigmatic P.T. at their Gamescom press conference. To be honest, it didn’t look like much. Introduced innocuously after a fun Metal Gear Solid V segment, it was advertised as an ‘interactive teaser’ for a new IP from a new studio called 7780s. The actual trailer for it was awful, filled with night vision shots of people screaming at supposedly frightening things happening within the game. I tweeted at the time that if it was a real horror game, I wanted it, but also retweeted an opinion that horror properties that rely too heavily on those audience reaction shots don’t tend to be good properties. It reminded me of the trailer for the first Paranormal Activity. And not in a good way. But, as a fan of the genre, I felt fairly obligated to download it. At the very worst, I’d have a brand new thing to write a blog post about, even if it ended up being bad. First impressions were that this thing is gorgeous. I exited the nondescript opening room into what honestly looks like a photorealistic hallway. Immediately this thing blew away any expectations I had of it being some cheap thrown together product. Just the lighting alone was amazing. The way the lantern on the left wall cast shadows, even down to the reflections in the wood panel floor. Not a single detail was out of place. I followed the hallway around, already feeling tense in the way that only the most atmospheric horror can manage. Even though everything was well lit, I expected the worst around every corner. A disembodied voice I later found coming from a radio told a story, news report style, of a father who killed his pregnant wife and son before hanging himself with a garden hose. The atmosphere was palpable. Then the game asked me to go through the only open door, and down into the basement. I’ve seen enough horror in my time to know that’s a bad idea, but with a confident whisper of “Do it for the blog” I pressed on. And opened out into the same hallway. I was hooked, I had to solve the mystery and find out what this thing was. Even though things got even more intense, with doors rattling, lights going out, each trip around the hallway changed things up just a little. Until suddenly the door to the basement was closed and the bathroom door creaked open. This was my first introduction to Lisa, the ghost that haunts this weird little game. She was only there for a split second before the door slammed shut. Honestly, the fact I had enough forethought to slam on the PS4’s share button, even as I jumped out of my skin… It’s the sort of reflex that I can only credit to going on 15 years of playing horror games. And really, this is the way to do an effective jump scare in my opinion. I see people decrying them as cheap, but used properly they can be an excellent climax to a long build of tension. But not only that, they also function as a threat. A jump scare carries with it the expectation of another down the line, and the longer the tension rebuilds, the more intense that threat becomes. Jump scares have a bad reputation because of how overused they have become. But P.T. knew exactly how and where to use them. The next scare came around after looping around the hallway a couple more times. The radio was back on, the DJ telling the same story about the murder suicide, interspersed with out of place bits like the one above. Then, in its friendly voice, it suggested I turn around. As you can maybe imagine, this was quite enough for me. I’ve been playing horror games for nearly 15 years now, and I honestly don’t remember the last time something scared me this much. It looks like the simplest of jump scares, and in lesser hands, it would have been. But this was expertly done, after a constant build up of tension and release. I was frightened out of my mind, but at the same time, I was thoroughly impressed. By the time I switched off, the boards over at NeoGAF were lit up with speculation, and as it turned out, Twitch streamer SoapyWarpig was minutes away from cracking it wide open. IMPORTANT NOTE: I have included the link to SoapyWarpig’s Twitch channel because I believe crediting is important. However, it has not escaped my notice that people have been leaving nasty messages for her, calling her things I will not repeat here. I would like to believe it’s not because of her gender, but I’m not that naive. So please, feel free to go on over and watch her stream, but do not harass her in any way. Anyone who thinks harassment for any reason is acceptable is not a friend of the site and is not a friend of me. Carrying on, the whole thing was a teaser for a new Silent Hill, with the involvement in unknown capacity so far of Hideo Kojima and Guillermo Del Toro, starring Norman Reedus in the lead role. To be honest, this is huge. Let’s just break it down piece by piece for a second here. Firstly, the press conference. Sony delivered a Gamescom press conference that people criticised for not having enough big revelations. A lot of forum chatter after was about how Microsoft ‘won’ Gamescom with their big Tomb Raider announcement and Quantum Break gameplay. The announcement of Silent Hills would have been massive, especially with the people involved, yet somehow Kojima (and given his little games with The Phantom Pain a couple of years back, I have to imagine he’s behind all this) convinced them to announce P.T. as a teaser for a new IP, in what frankly felt like a throwaway segment. Secondly, we have Konami, who have given no indication over the whole last console generation of caring about Silent Hill as anything more than an also ran. Sure, we had some releases in the meantime like Shattered Memories, Homecoming, and the criminally underrated Downpour but none of them seemed to receive the same care and attention from Konami as the original four games did. And now suddenly the franchise is moving back to a Japanese development team, with the involvement of Hideo Kojima and Guillermo Del Toro?! That’s insane! In fact, it’s pretty much the best possible news for the franchise, aside from maybe Konami putting back together the original Team Silent to work on a true Silent Hill 5. If I felt like being cynical, I’d wonder at how much of it is pressure from Kojima himself, and Konami basically bowing to his demands knowing that after he’s done here, he’ll produce another cash cow for them in the form of another Metal Gear Solid game. But I don’t want to be cynical. For once, I just want to take all this as good news, and hope the franchise succeeds in this shot at redemption. Judging by the quality of P.T, Silent Hills is going to be utterly terrifying. But there is another side to all this I haven’t quite discussed yet. While P.T. is extremely good at tension and atmosphere and generally being scary, and while it is perhaps the best way I have ever seen a new game get revealed, it’s not quite a good game in its own right. The truth is, there’s not really a lot of meaningful player interaction here. We’re sort of limited to poking and prodding at things, and being herded along to the next section so we can be presented with another piece of the story or another scare. It’s all very well presented, and it does make for an excellent teaser, but I’ve heard people say it could have been a retail product on its own and I disagree with that. The gameplay is simply not there. 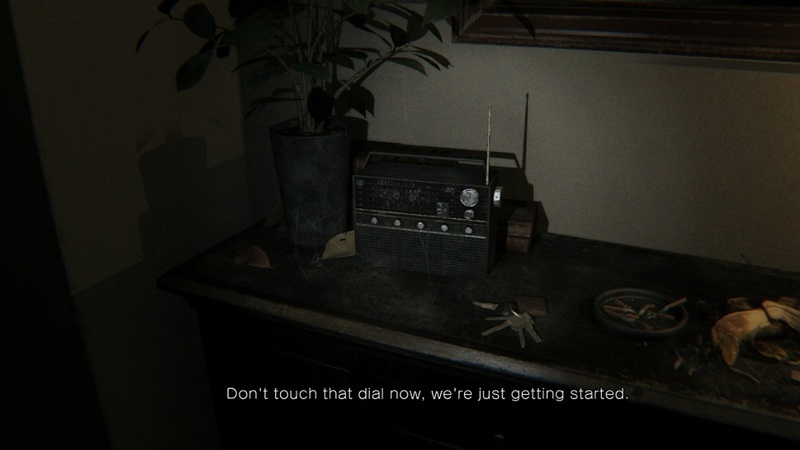 Even though it’s similar in concept to Outlast (first person, no combat), the former game had the gameplay loop of running from enemies, hiding from them, conserving batteries. In P.T. the only loop is through the endless hallway, our interactions limited to zooming in on objects; looking rather than touching. For what it is, it’s very good. But as the name suggests, it’s a playable teaser, not a game in its own right. This is no more evident than in P.T‘s final puzzle, the solution to which entire communities are still trying to brute force. People seem to stumble across solutions, getting the phone call and finally seeing the teaser video for themselves, but there never seems to be a consistent logic to it, and the results are often not repeatable. I myself have not yet managed to crack it, despite spending many hours trying. Many of the Silent Hill puzzles have been obtuse and hard to crack, but at the end of it, there was always some logic to reaching the answer, no matter how twisted. It always made sense. I just hope the puzzles in Silent Hills are better designed. I have to believe they will be, simply by virtue of not being designed to bar progress for a certain amount of time in order to make a greater impact when the ending is revealed. At the end of the day, for all my complaints, I’ve never quite seen anything like P.T. It’s exciting because not only does it herald the return of my favourite franchise (and hopefully its return to glory and prominence after years of neglect) but it could perhaps signal lifesigns in a genre long ignored by the larger publishers. This console generation is still a new one. But it was hard to not be jaded over the last eight years or so, watching as promising new survival horror franchises like Dead Space gradually moved into more action territory at the whims of men in suits looking at sales charts. Even classic franchises weren’t spared, with Capcom positioning Resident Evil 6 in some weird attempt to get Call of Duty fans on board, with campaigns full of setpieces and explosions. They failed of course, like anyone with half a brain could have told them they would. P.T. is exciting because it’s another sign that big publishers are starting to embrace survival horror as a viable genre again, due in no small part to indie developers keeping it alive these past years in one form or another with games like Outlast and Amnesia. This year alone we have Alien Isolation and The Evil Within waving the genre flag with pride, and even Capcom are testing the waters with a port of the Gamecube remake of Resident Evil heading to most major platforms. I want these games to be good, and more importantly I want them to do well. Not only to pave the way for Silent Hill to make a grand return, but to breathe life back into a genre that has been left for dead for too long. Survival horror may finally be coming back in a big way. And I can think of nothing more exciting than that. Don’t touch that dial now – we’re just getting started. Still images taken using the PlayStation 4 screenshot share function, aside from the Norman Reedus picture and the Silent Hills logo, both of which were sourced from the Silent Hill Wiki. Moving images were taken using the PlayStation 4 video share function. Surviving Horror banner and GIF conversion by Rachel Mansell. This entry was posted in Surviving Horror and tagged Capcom, game reviews, Games, Gaming, ghosts, haunted, Horror, horror games, outlast, P.T., playstation 4, PS4, review, silent hill, survival horror by Chris. Bookmark the permalink.